Browns is ever popular, it now has over 20 locations across the UK and with another opening soon in Liverpool. The Nottingham branch follows the same pattern as most, it is well kitted out with a stylish brasserie décor with staff smartly attired. The menu contains all the classics, from prawn cocktail (£6.50) to fish and chips (£12), and with some more ambitious dishes such as Teriyaki Sea Reared Trout (£14). They also open early for breakfast and lunch. I dined with some friends on a Thursday night, when we arrived it was already packed which is always a good sign. One challenge with their layout is that the bar/restaurant are barely segregated so noise levels were significant throughout. The lighting was also spectacularly dim so apologies for the murky pictures. There is a good, varied wine list. We drank a Montepulciano at £18 but options range from £14.5 to some ‘reserve’ options at £50+. After being seated we were quickly informed that there would be a wait for food. We only ordered 2 starters, both of which were cold so it was surprising that there was such a significant wait. I ate Smoked Venison (£7.50) which was prettily presented. Served with celeriac & apple with two dressings, the venison was relatively frugal. The biggest disappointment however was the apple, celeriac was too heavy on mayonnaise which dominated the dish. 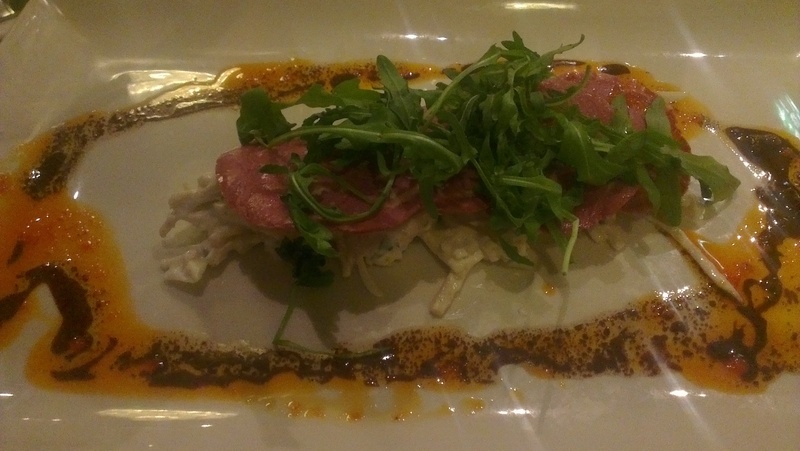 The only other starter ordered by our party was a duck terrine and was met with an equally muted reception. Another long wait ensued before the arrival of the main course, for which we had quite an array. A steak pie (£12) had a good gravy and a plentiful amount of meat, the pea mash coming with it had a nice sweetness from the peas but had the texture of something that had been sitting on the plate for some time. Vegetarian options were ample with a friend eating a Stilton, Sweet Potato, Squash & Spinach Filo Parcel (£10.50) which impressed. My ‘smaller’ burger was happily not too small, although when the highlight of the main course are onion rings it isn’t an overwhelming success. 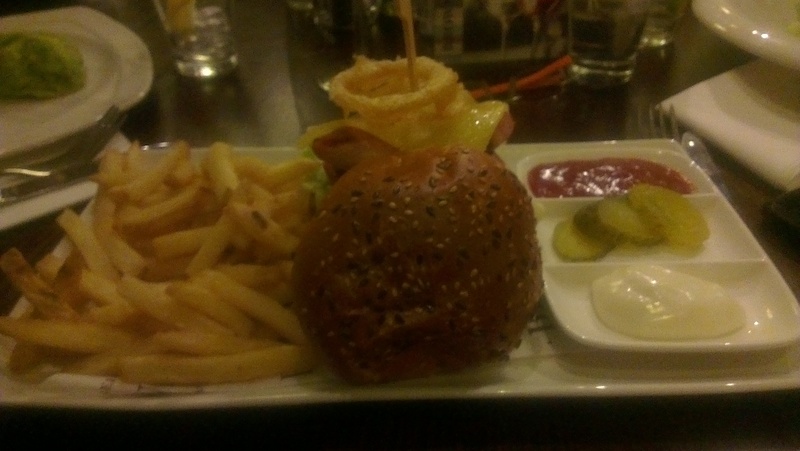 The burger itself was ok, a touch overcooked but with fine elements in the bun. Fries were simply ok, lacking a bit of salting. 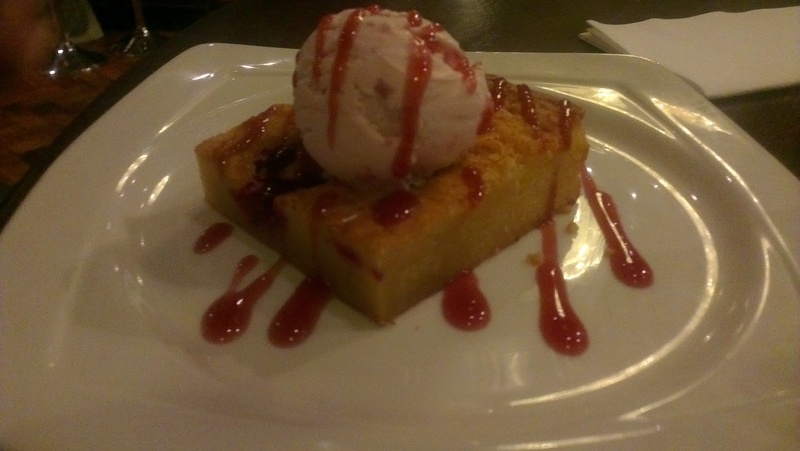 We tried a couple of desserts which were again nicely presented and probably the best part of the meal. A blondie was surprisingly light with a nice ice cream to compliment it with a traditional and rich sticky toffee pudding also good. Whilst the food was pleasant, and no more than that, my overriding memories are of the service which was slightly shambolic. Long waits were punctuated by the odd mistake too. A portion of chips was missed, a requested 2nd spoon to share a pudding wasn’t delivered and I had to hunt someone down in order to pay! One waiter who was a bit more switched on did rectify the mistakes but the damage had already been done. At the end of the day Browns does provide some solid brasserie food at prices which I think are slightly high but reasonable. If it wasn’t for the service I think I would find it easy to like, but hard to love.